Archive News Don't see what you want? We buy and sell more than $7 million per year in coins and other collectibles, so please email us your want list at order@collectorsinternet.com and we'll be happy to quote our best price. 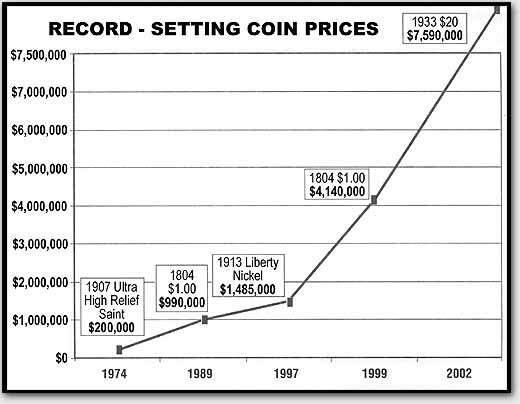 IS 2013 THE YEAR FOR THE GREATEST COIN BOOM? Mr. Baker is the former editor of The Coin Investment Newsletter from 1978 to 1987 and is a retired Numismatic Investment Consultant for California Federal Bank and many other banking instituions from 1987 to 2001. He is currently a contributing editor for Rare Coin Magazine and spends most of his time investing and collecting coins. Something is happening this year that I have never seen the likes of in forty years of collecting and investing. All this week, excited and enthusiastic members of the American and Beverly Hills Coin Clubs have been sending dozens of e-mails about very heavy demand for ALL U.S. coins at the FUN show. One investor, Paul Cooper, told me that many collectors, dealers and investors started the show a day early, buying in hotel rooms, lobbies, restaurants, and anywhere else they could secure a spot to conduct business. �This was the strongest show I�ve seen in thirty years, even stronger than the last major coin boom of 1978-1980. I think a coin boom is going to occur that will make all the other coin booms of last century pale in comparison�, he stated. So what is a coin boom anyway? Many new collectors I�ve asked have not heard of this phenomena. A Coin Boom occurs when there are sudden and dramatic demands in coins due to a number of factors which causes prices for most if not all coins to suddenly rise sharply in value in a period of a few weeks or months. During these boom periods, most if not all coins increase by at least 50% or more, and many even double or triple in value. Such periods occurred in 1936 to 1942 during the introduction of U.S. Proof Sets by the mint. Demand for these sets went up over 50% per year during the time, as evidenced by the increasing numbers produced each year. Another great boom occurred in the mid 50s, as evidenced by a doubling in proof production almost every year from 1953-57. Other booms occurred with the increase of gold and silver in 1974, 1978 and 1989. 1.) Increased favorable exposure about coins in the press, eBay, electronic media, and by word-of-mouth. 2.) Growing demand from a collector/investor/dealer base that in turn keeps growing with population pressures and increases in spendable income. 3.) Inflation and distrust in paper investments and currencies that are no longer backed by gold or silver. 4.) Insecurity in the global economy and national economies during times of unrest or potential war. According to many well respected wholesale dealerships, including Blanchard and CollectorsInternet; in the past few months alone, Japanese investors have purchased over $50,000,000 (that�s $50 million) in U.S. collector coins. This is important to note for several reasons. Firstly, most Japanese are known for their investment intelligence. For example, they hold a lot of real estate, gold and silver, which have increased in value by about 20% in the last few months. Secondly, many tend to hold their investments for a lifetime, sometimes passing holdings along from generation to generation. This $50 million in coins sucked out of the U.S. market last year will probably not be in U.S. hands for a long time, even if prices double or triple. �We have sold thousands of BU gold coins, Morgan dollars and type coins to Japanese investors just in the past two weeks of 2007,� reported Anthony Sears of CollectorsInternet.com, �Everything from low grade Indian cents to average BU silver dollars and Choice BU gold coin. They tend to buy everything we have that�s unslabbed, because they don�t want to pay higher prices for expensive slabbed coins than for the less expensive, unslabbed coins that are in strong demand and going to increase in value anyway. We are already seeing larger e-mail orders from Taiwan and Europe�, he notes. �We used to buy and sell holed, damaged large cents and seated coins for under a dollar each. Now, we can�t get these for less than $4 each, a four-fold increase. We were selling average BU (MS 60) Morgan dollars for $12 each a couple of years ago, and now are offering to buy them back from customers for $24 each, essentially doubling their money. We were selling BU $20 gold coins for about $325 each four years ago, and now are offering to buy the same coins back at $650 each. This is just another case where our customers have doubled their money in a few years, and this applies to all coins across the board, from cents to dollars and gold, no matter how low the grades or prices. But many of our customers are holding on to them, and we don�t blame them." �Collector coins of all types and denominations offer stability�, notes Greg Austin, a millionaire investor in Texas, �and I�m buying everything from half cents and large cent to Walking halves and silver dollars. It�s not just about gold and silver, because collector coins satisfy the growing demand for rarity, art and history. You can�t get that with the modern bullion coins.� Indeed, oil paintings that are much more fragile and vulnerable to the elements, are selling for tens of millions of dollars. It appears that finally rare coins are catching up (see chart). Many people from other Asian and European countries tend to follow what the smart Japanese investors do, and therefore many analysts predict that the $500 million spent by the Japanese will easily be tripled or more by the end of this decade. Thirdly, add greater foreign demand to already strong demand here in the U.S., and we begin to see a coin boom probability like no other in history. Fueling the demand for coins in the U.S. are the state quarters, increased exposure to coins on the internet, positive press about rising coin prices in the news, and investors� distrust of paper investors and more trust in solid investments that investors can hold , share and enjoy. All reports so far from the FUN show indicate it was very difficult to buy anything, since most dealers had sold most of their inventory and were looking to buy more for their inventories. This law of supply and demand is just a small part of the large body of growing evidence that suggests we just may be in for a large and long coin boom that will probably be heard around the world pretty soon.